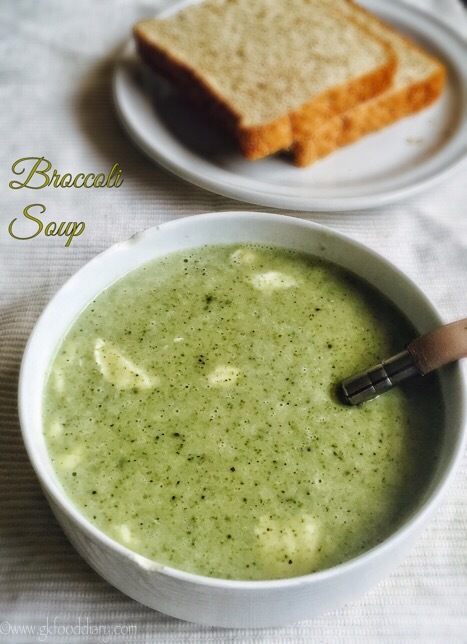 Broccoli Soup - Easy and healthy soup for toddlers and kids with broccoli & potato. Wash broccoli & potato in running water well. Then peel the skin off from potatoes with a peeler. Then chop them into equal size small cubes. Take florets from broccoli and keep it ready. Finely chop onions & garlic. In a pressure cooker, heat a tsp of butter and add garlic. Saute them for two minutes. Now add onions. Fry them nicely until golden brown. Now add chopped potatoes and broccoli. Give a quick stir. Pressure cook the broccoli, potatoes, garlic and fried onions together with a cup of water for 3 whistles. Once the pressure is released open the cooker, it will be soft and transparent. Transfer the cooked ingredients to a blender. Grind it to a smooth paste. Then heat the soup in a saucepan for two minutes. Add milk and bring it to a boil. Lastly add required salt, pepper powder and fresh cream/grated cheese. Mix well. Switch off the flame and serve warm.